Everyone loves grilled cheese. But melting a beloved dairy product between two slices of bread doesn't stop at your typical yellow American and white bread combo. Cultures across the world have stumbled on this most simple winning formula: bread and cheese go together to create a great meal. 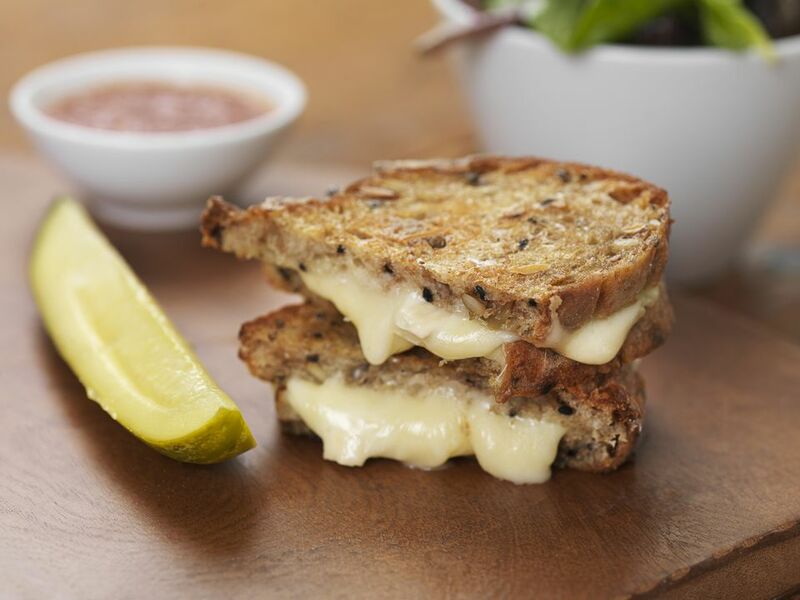 Here are some of the most tempting types of grilled cheese from around the globe. What It Is: The classic American grilled cheese is simply a piece of American cheese layered between two pieces of white bread and then griddled with butter. Story Behind It: In 1916, James L. Kraft obtained a patent for processed cheese. The method made it easy to transport cheese without it spoiling or perishing. Soon, families began slicing the cheap processed cheese, laying it between white bread, and then grilling it. It has become a staple for family meals across the country. What It Is: In a Croque Monsieur, Gruyere cheese is melted inside a ham and cheese sandwich. Bechamel sauce and more Gruyere cheese then tops the sandwich. The sandwich is broiled to leave a nice gooey crust. A Croque Madame adds a fried egg to the top of the sandwich. Story Behind It: The legend goes that workers left their ham and Gruyere cheese sandwiches near hot radiators and came back to discover that the cheese had melted. Whether true or not, the sandwich began appearing on Parisian menus in the early 1900s. What It Is: Mozzarella cheese is melted in a bain-marie (or double boiler) in a French bun with the soft inner part removed. Then, roast beef, tomatoes, and pickled cucumbers are added to the sandwich. Story Behind It: In 1934, a student named Casemiro Pinto Neto, who was nicknamed Bauru because his hometown was Bauru city, really wanted a sandwich. He walked into Ponto Chic, a traditional restaurant and student hangout, and asked the cook to make the sandwich exactly to his specifications. Bauru's sandwich was an immediate hit and now it's one of Brazil's favorite sandwiches. What It Is: The arepa de queso is a stuffed corn cake made from masa flour and then cooked on a cast iron skillet. The arepa is filled with local farmer's cheese and then griddled again. The Cheese: Shredded farmer's cheese, or mozzarella if you can't find it. Story Behind It: Native Americans have been making arepas since before European colonization. In fact, the word arepa comes from "erepa" which means cornbread in the language of the indigenous people of Venezuela and Colombia. Early arepas were made with cassava (or yucca) flour, as well as corn. What It Is: A savory melted cheese sauce is poured over toasted bread and then broiled. The Cheese: Cheddar cheese is usually combined with ale to make the cheese sauce. Story Behind It: Welsh rarebit is an old recipe, originally called "Welsh rabbit." The legend goes that the Welsh were not allowed to eat rabbits at taverns and restaurants and so they substituted melted cheese, instead. The term was converted from Welsh rabbit to Welsh rarebit, to identify the differences in the two.